Can Contac® Cold + Flu medicine be taken during pregnancy? 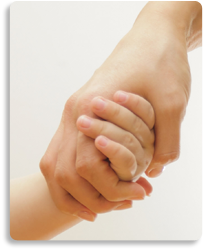 Dealing with the symptoms of a cold or flu while pregnant can be doubly uncomfortable. 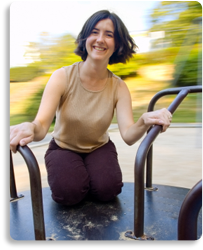 Many women want to know whether it’s safe to take Contac® Cold + Flu medicine while pregnant. Some medicines are safe during pregnancy and some are not. If pregnant or breast feeding, ask a health professional before use (be sure to print out a list of active ingredients). 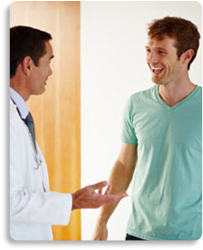 He or she will be most familiar with your risk-level and current medications. Can I drink alcohol with Contac® Cold + Flu medicine? Many people wonder whether it’s safe to drink alcohol while taking Contac® Cold + Flu medications. This product contains acetaminophen. Sever liver damage may occur if you drink 3 or more alcoholic drinks every day while using this product. It is inadvisable for you to drink alcohol while taking cold and flu medications. All Contac® Cold + Flu products contain alcohol warnings. These products contain acetaminophen, a popular pain-reliever and fever-reducer. While considered by the FDA as safe and effective for OTC use, acetaminophen has been shown to cause liver damage when taken in combination with three or more alcoholic beverages per day. The FDA notes that “alcohol abusers are at increased risk,” for possible liver damage. 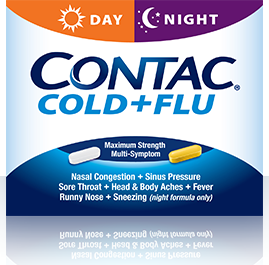 Contac® Cold + Flu Night formula also contains an antihistamine (Chlorpheniramine). Alcohol may increase drowsiness associated with this ingredient. 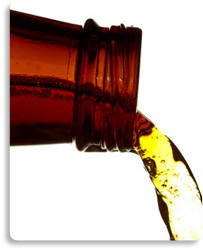 As stated on the label, when using Contac® Cold + Flu formulations, avoid alcoholic drinks. Can I take Contac® Cold + Flu with other medications? Drug interaction precautions appear on the back label of every Contac® Cold + Flu box. When in doubt, it is best to check with your doctor or pharmacist. As stated on the label, do not use Contac® Cold + Flu with any other drug containing acetaminophen (prescription or nonprescription). 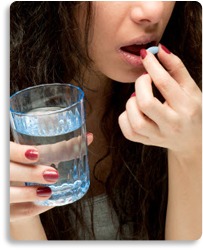 If you are not sure whether a drug contains acetaminophen, ask a doctor or pharmacist. Do not use Contac® Cold + Flu if you are now taking a prescription monoamine oxidase inhibitor (MAOI) (certain drugs for depression, psychiatric, or emotional conditions, or Parkinson’s disease), or for 2 weeks after stopping the MAOI drug. If you do not know if your prescription drug contains an MAOI, ask a doctor or pharmacist before taking this product. Can you treat the flu once infected? While there is no cure for the flu once you are infected, you can treat the symptoms of the flu and help speed recovery. For children and adults, over-the-counter pain relievers, decongestants and saline nasal sprays may help relieve some symptoms. Contac® Cold + Flu can help alleviate the symptoms that come from cold and flu infections in adults and children over 12 years of age. Symptoms will vary, so make sure to choose the Contac formula that’s right for you. Centers for Disease Control and Prevention. Get Smart: Know When Antibiotics Work; Symptom Relief. Retrieved from: http://www.cdc.gov/getsmart/antibiotic-use/symptom-relief.html. Accessed January 26, 2012. 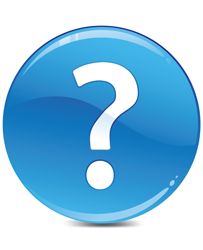 Did you discontinue formulas containing pseudoephedrine? Yes. As of October 2006 all Contac® Cold + Flu formulas which contained pseudoephedrine now contain phenylephrine. The formula change was due to the restriction of pseudoephedrine in certain states, not because of any safety issues with the Contac product when it was used according to the directions. Does Contac® Cold + Flu contain aspirin? No. 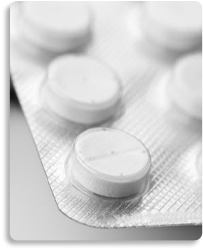 Contac® Cold + Flu products do not contain aspirin. The analgesic (also known as pain reliever) used in Contac® Cold + Flu medicine products is acetaminophen. Acetaminophen is one of the most commonly used drugs in the United States. It is widely and effectively used in both prescription and over-the-counter (OTC) products to reduce pain and fever. Does phenylephrine work as well as pseudoephedrine? In 2006, the Contac® Cold + Flu formula was changed due to the restriction of pseudoephedrine in certain states. The nasal decongestant pseudoephedrine was restricted because of misuse by some individuals. It was replaced with the effective nasal decongestant phenylephrine. Phenylephrine is a decongestant used to relieve nasal discomfort caused by colds, allergies and hay fever. Phenylephrine is also used to relieve sinus congestion and pressure. Phenylephrine and pseudoephedrine are generally viewed as interchangeable. If you are concerned, please consult with your healthcare provider. There are plenty of misconceptions regarding the spread of cold and flu viruses. Have you ever wondered how the cold and flu are actually spread? Viruses spread when an infected person coughs or sneezes, expelling viral-infected droplets several feet. These viruses can also live on any object that comes in contact with an infected person. Objects such as door handles, telephones, towels, and silverware can spread a virus days after being contaminated. Touching your nose, mouth or eyes after handling an object contaminated by a virus will likely infect you. A person infected with a flu virus can spread the infection one day before symptoms emerge, and for up to a week later. Centers for Disease Control and Prevention. Seasonal Influenza: How Flu Spreads. Retrieved from: http://www.cdc.gov/flu/about/disease/spread.htm. Accessed January 26, 2012. The flu is a highly contagious virus that can be prevented, in part, with certain basic practices. We’ve compiled some information on precautions you can take to prevent the flu, and ways you can help stop the spread of the flu virus. Get a flu shot every year. The CDC (Centers for Disease Control and Prevention) recommends a yearly flu vaccine as the first and most important step in protecting against flu viruses. Wash your hands often with soap and water or an alcohol-based hand rub – it’s one of the best ways to avoid catching, or spreading the viruses you come in contact with. Never share glassware or silverware with infected persons. Practice good hygiene, such as covering your mouth when coughing or sneezing. Stay home from work or school when you are sick. While sick, limit contact with others as much as possible to keep from infecting them. Properly dispose of tainted tissues. Centers for Disease Control and Prevention; Seasonal Influenza (Flu). Retrieved from: http://www.cdc.gov/flu/protect/preventing.htm. Accessed January 23, 2012. How does Contac® Cold + Flu Cooling Relief liquid provide “instant” cooling relief? The flavoring in Contac® Cold + Flu Cooling Relief provides an instant cooling sensation to your sore throat. Due to its liquid formula, the active ingredients in the product are released immediately, allowing them to go to work quickly. How is Cooling Relief different than other Contac ® Cold + Flu products? Contac® Cold + Flu Cooling Relief is a liquid product and contains different ingredients than other caplet products. It works on a range of symptoms but is particularly effective on sore throat pain. What ingredients are in Contac® Cold + Flu and what do they do? 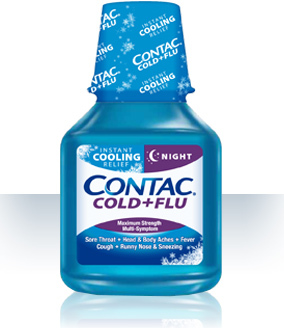 Is Contac® Cold + Flu Cooling Relief liquid for day or night? Contac® Cold + Flu Cooling Relief is a night time formula due to the antihistamine. It’s designed to help you rest at night and wake up refreshed. If you suffer from allergy cough, itchy throat or allergy headaches, you are probably very familiar with the term antihistamine. But do you know what an antihistamine really does? As the name implies, antihistamines block the effect of histamines. 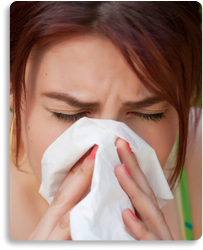 Histamines cause sneezing and the excessive nasal secretions of allergic reactions. By blocking the effect of histamines, antihistamines help reduce the runny nose, sneezing and watery eyes that often bother cold, flu and allergy sufferers. The antihistamine used in Contac® Cold + Flu medicine products is Chlorpheniramine Maleate, which may cause drowsiness. Only the Contac night formula, Contac® Cold + Flu Night, contains an antihistamine because of the drowsy effect that it may have. Use caution when driving a motor vehicle or operating machinery. Please see product packaging for complete safety information. Why is there a thyroid disease warning? Contac® Cold + Flu packaging contains a warning label stating that patients should contact their doctor before taking Contac® Cold + Flu if they have thyroid disease. Why is this warning important and what does it mean? 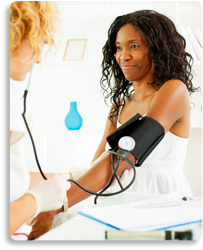 Hyperthyroidism predisposes some patients to increased heart rate. Many decongestants, including Phenylephine (which is used in Contac® Cold + Flu formulas) may increase that effect. If you have hyperthyroidism, your physician can help determine if using products with phenylephrine is appropriate. As stated on the label, check with your doctor before using Contac® Cold + Flu if you have any of the following conditions: liver disease, heart disease, thyroid disease, diabetes, glaucoma, high blood pressure, trouble urinating due to an enlarged prostate gland (if male), or a breathing problem such as emphysema or chronic bronchitis. Contac® Cold + Flu advises patients suffering from heart disease, high blood pressure and/or diabetes to consult with their doctor before using Contac. Decongestants in cold medicines decrease the size of enlarged blood vessels in nasal passages, but they can also affect blood vessels in the rest of your body and raise blood pressure. For most people, this increase isn’t significant. However, some people (especially those who already have high blood pressure) can have exaggerated responses to decongestants, contributing to dangerously high blood pressures. As stated on the label, check with your doctor before using Contac® Cold + Flu if you have liver disease, heart disease, thyroid disease, diabetes, glaucoma, high blood pressure, trouble urinating due to an enlarged prostate gland (if male), or a breathing problem such as emphysema or chronic bronchitis. Why is there a warning for nervous, dizzy and sleepless symptoms? 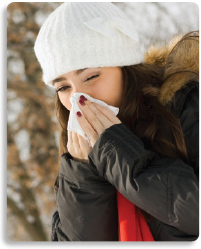 Contac® Cold + Flu products contain the nasal decongestant phenylephrine. Nasal decongestants are adrenalin-like substances that stimulate the sympathetic nervous system. When taken in excessive doses, phenylephrine has been known to cause nervousness, dizziness and sleeplessness. Phenylephrine belongs to a class of drugs which reduces swelling in the mucosa and decreases nasal airway resistance. It has also been shown to have stimulating effects, which can result in sleeplessness when taken in excessive doses. Stop use and ask a doctor if you get nervous, dizzy or sleepless while using Contac® Cold + Flu products. Will you have a day-time version of Contac® Cold + Flu Cooling Relief? At this time, we don’t have a day version of Contac® Cold + Flu Cooling Relief liquid but we’re always interested in hearing about anything that our consumers want. Let us know if a day-time version would be a good idea for you.